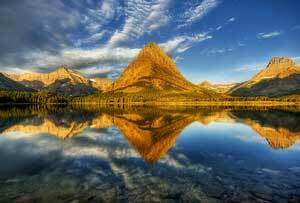 Many Glacier Hotel is one of the best Glacier National Park hotels. Learn why you must book a room at Many Glacier Lodge during your Montana vacation. Dwarfed by the mountainous alpine scenery of Glacier National Park, Many Glacier Hotel was built by Louis Hill and the Great Northern Railway to accommodate the tourist rush to the area in 1915. Many Glacier Lodge was promoted as one of the most noteworthy tourist hotels that has ever been erected in America.. Indeed, it continues to impress today. It was deservedly listed as a National Historic Landmark in 1976. 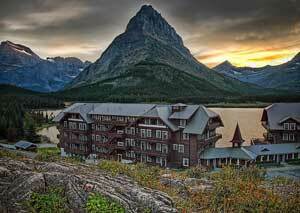 Serving visitors to the northeastern side of Glacier National Park and located to the east of the Continental Divide on the shores of Swiftcurrent Lake, this 5-story swiss chalet-style hotel is popular for hiking and wildlife watching. Boat trips are available on Swiftcurrent Lake aboard the historic Chief Two Guns. Grinnell Glacier, one of 3 glaciers in the area, is easy to reach by boat followed by a 2-mile hike and should not be missed. Accommodations at Many Glacier are rustic and comfortable in an old-world style. The 214 guest rooms are in two chalet-style buildings offering various degrees of comfort. Local singer/songwriter David Walburn entertains with his guitar and harmonica most evenings, or you can just relax and drink in the spectacular views from the lakeside verandah. Views of Grinnell Point, Mount Henkel and Mount Gould, the most photographed peak in Glacier National Park, are spectacular from Many Glacier, especially after a rain shower when rainbows arch across the valley. The nearby forests are home to grizzly bears, black bears, mountain goats, big horn sheep and other creatures whose night calls may break the silence! Guests at Many Glacier Lodge will appreciate the stunning lake views from the Ptarmigan Dining Room, or while enjoying lighter snacks from Heidi’s Snack Shop, AprÃ¨s Fondue, the Swiss Room or the Interlaken Lounges. The Grizzly Track Traders Gift shop, ATM cash machine, ranger programs, bus tours, boat trips and other activities will certainly keep you busy. Staff may entertain with music, theater productions, slide shows and ranger talks, giving the hotel a very friendly atmosphere. The hotel is only open from mid June to mid September as it is more isolated than other Glacier National Park hotels, but believe me, the trip is worth it for the spectacular scenery here. Looking for spa-like luxury? Too bad. You won’t find it in Many Glacier as the accommodations in Many Glacier Hotel are simple and rustic rather than luxurious. 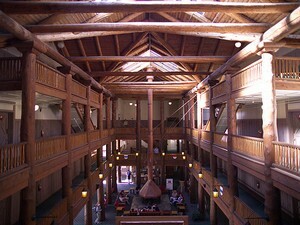 Due for renovation in 2011, Many Glacier Lodge is brimming with historic themed decoration. The creaky elevator only goes as far as the fourth floor, so be prepared to climb some stairs. Standard rooms are adequate, but it may be worth paying a little more for the exceptional views from the Lakeside View rooms. Value rooms are also available, which are smaller and may be on a higher floor. There are several places to dine at Many Glacier Lodge, including the Ptarmigan Dining room, which overlooks Swiftcurrent Lake through huge windows. The buffet breakfast here is personally recommended! There is also a pub and a guest lounge area, as well as a snack bar in the lobby. Have you stayed at Many Glacier Hotel and Lodge? 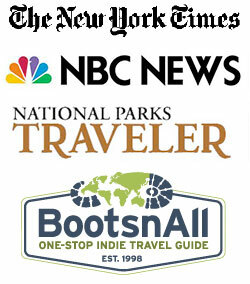 Share your review of this Glacier National Park historic lodge. July (due to snow). Do you know answers?